It’s hard to separate beef from those nostalgic silhouettes of Wyoming’s history: cowboys, pioneers, rolling plains, and scarcity of all sorts. A late-19th century thoroughfare for entrepreneurs, hardworking families, and those seeking opportunity, the Equality State had the land and, eventually, the wealth, to establish an enduring addiction to cattle. 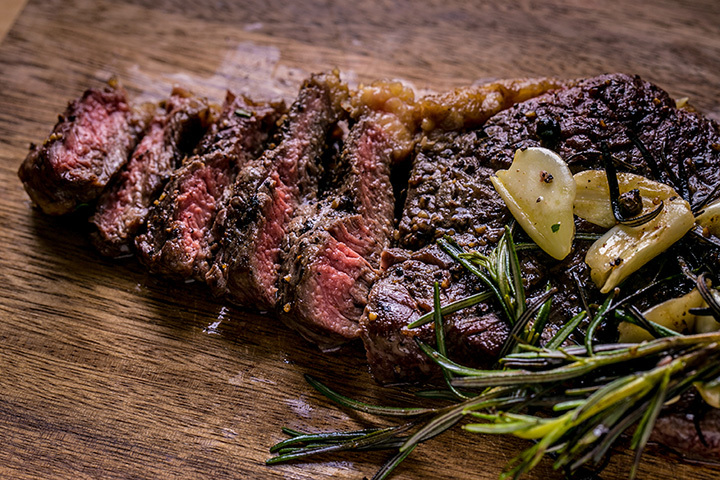 Here are the 10 best steakhouses in Wyoming. A Culinary Institute-trained and James Beard-nominated chef runs this hip and creative steakhouse. A disciple of Jackson’s renowned Old Yellowstone Garage, the menu here is expertly executed, sleek, but still approachable. The eclectic speakeasy vibe makes for a charming, but classy, night out. While the assortment of apps and game meats are worth their own visit, the steaks here are the stand-out. Splurge on real Wagyu beef, go for the lip-smacking bone-in ribeye, or a tasty baseball cut, perhaps? Housed within a former taxidermy and wildlife museum, the Gun Barrel is a perfect amalgamation of Western/casual/friendly and frontier/rugged/carnivorous. Unlike many of its competitors, this steakhouse sports an excellent selection of game meats, for that eclectic, deeply savory and slightly gamey flavor of the real Rocky Mountains. The taxidermied local fauna, log interiors and seating, and pine-yellow lighting all encircle the diner, creating a memorable, comfortable and delicious steak dinner, Wyoming style. The buffalo prime rib, elk chop and bone-in ribeye are all stellar. Miners & Stockmen’s flaunts two important assets (and rightfully so): they use USDA prime cuts, and dry-age their meats in-house. Oh yeah, and it’s also the oldest bar in Wyoming. Established in 1862, the venue’s history and delicious steaks have made something of a landmark out of a town of less than 80 people. Dark cherry seating and tables, shimmering copper ceilings and warm, vintage lighting all bolster this supremely attractive century-old ambiance. Though carrying an expectedly high price tag, the porterhouse is definitely worth its weight (literally). Rib eye with mashed potatoes and carrots in a sweet and spicy glaze sauce over farro. For more than 15 years, this Bozeman-based company has imprinted itself onto smaller-town steakhouses. Aiming for approachable, unpretentious, but deliciously-filling sizzling meats, the Rib & Chop House manifests that inimitable “rocky mountain hospitality.” But don’t let this casual approachability mislead. The steaks are expertly cooked: just the right amount of char, fat and melt-in-your-mouth tastiness. The 16-ounce New York strip or hand-cut ribeye come highly recommended. The yearly Cheyenne Frontier Days is a singular celebration of all things authentically Western. For a week in July, massive convention grounds become a frontier mecca: horse trailers, cowboy hats and hot food stands stretch across the horizon. Amidst the milieu of activity, bronc’ riding provides the recognizable silhouette for the entire event. And T-Joe was one of those famous buckin’ broncs. This restaurant does him proud, producing a warm, family-friendly, casual vibe with some of the best steaks in southern Wyoming. The “blackened” prime rib and house T-bone steal the show. Snake River Grill has lived for two decades in Jackson’s Town Square, a center of gravity for arts and entertainment in the resort region. With all the competition in the area, Chef Jeff Drew’s spot edges out much of the competition for it’s great wine selection—over 300 bottles—and a menu that’s simultaneously forward-thinking and Western-nostalgic. There’s the pristinely-executed dishes that combine the comforts of steak, scallops and sharable small plates, with modern technique and flair for eclecticism. The Kansas City-style buffalo steak is supremely savory due to dry age, and the real local wagyu is like butter (and it comes with house-made tater tots!). Built upon the grounds of a Civil War-era fort, this decades-old eating spot is a testament to its frontier roots. Unabashed, hearty and unapologetically honest, the food, decor and vibe at Calvaryman is nothing if not satisfying. The supper club turned restaurant serves steaks, seafood and pub essentials that complement an impressive list of liquors and wine. Expect to leave full, happy and with more money in the wallet than expected. The bison ribeye is noteworthy, sourced from local ranches and literally tasting of Wyoming’s harsh but sustaining prairie. This meat mecca is a magnet for those seeking quality local beef, flame-grilled. And in Wyoming, where’s fire, there’s meat, and that always means a nice glass of red (just enough to cut the fat from a sizzling ribeye). Happy hour is great time to try out FireRock, not only for some affordable finger foods, but wines by the glass are $2 off (and they pour six ounces! Not bad.). But when the lights dim and the sizzling steaks make themselves known, the FireRock wood-fired grill really proves its worth. For a nostalgic relic, the bacon-wrapped fillet inspires fond memories, and the bone-in ribeye and New York strip toe the flavor-fat line quite deliciously. Cradled by the rocky sentinels of the Bighorn Range, Buffalo and the surrounding wilderness is a beacon for hunters, hikers, mountain bikers and fishermen. The picturesque environs and their sparse beauty both provide, and necessitate the consumption of, quality, grass-fed protein. And Winchester rises to the occasion, in spades. In fact, it’s worth spending a night in town, just for the steak. The massive stone hearth is the centerpiece, ornamented with ungulate trophies and a replica of the restaurant’s namesake. But the relatively unadorned dining room wastes little time on unnecessary decor: it’s only about the meat. Go for the prime rib, unabashedly slathered in jus, with the requisite horseradish and baked potato. The Four Seasons is well-known. Add the incomparable ruggedness of a Teton ski resort, and the Westbank Grill has an unfair advantage. The supreme modern-mountain menu with delicious, precise dishes makes use of its enviable biosphere to full effect. The menu is approachable, yet refined, articulating the chef’s combining more recognizable (and delicious) relics of fine-dining menus with local mountain ingredients and modern obsessions with local, grass-fed and sustainable. Though carrying a hefty price tag, the experience writ large is indeed worth it. Meats from the 1,200-degree broiler are one-of-a-kind: a mid-rare Wagyu New York strip steak, embellished with seared foie, Yukon puree and horseradish cream, a 16-ounce dry-aged ribeye, or the 40-ounce (yes, 40) porterhouse. Believe it or not, they taste better aside the massive rock fireplace, throwing shadows on the lodge walls and across the faces of smiling diners.